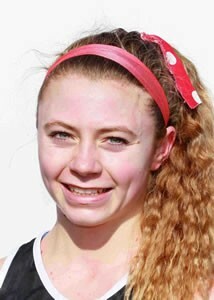 Haddonfield Memorial High School junior Briana Gess’ quest for a third straight first-place finish in the girls’ 1600-meter run at the NJSIAA spring Meet of Champions was unlike her previous two. For starters, Gess didn’t have the fastest seed time entering the event despite being the two-time defending champion. Both Ciara Roche of Freehold Township High School and Christina Rancan of West Windsor-Plainsboro South High School had run faster times than Gess in their respective group championship meets. Gess also hadn’t had anyone run side-by-side with her down the stretch in her previous Meet of Champions victories. This year, Roche kept up with Gess nearly all the way until the finish line. However, nothing was going to keep Gess from putting her name in the record books once again. Gess edged Roche by just less than half a second to win the girls’ 1,600-meter run for the third straight year. Gess is one of only five girls in state history to win the 1,600-meter run three times. Gess said she knew repeating as the 1,600-meter run champion would be a tall task. She wasn’t concerned about her competitors’ fast times, however. This year’s race felt way different to Gess from start to finish. The difference was apparent in the speed of the race. As a freshman, Gess won the 1,600-meter run at Meet of Champions with a time of 4:45.97. That year, three other runners also posted times under 4:50. This year, Gess’ winning time was 4:50.09. On the final lap, Gess and Roche broke away from the other runners and were nearly side-by-side coming down the final stretch. Gess managed to pull just ahead and hold off Roche to the finish line for the victory. Gess admitted it was easily the closest race she has run at a Meet of Champions so far. The first-place finish at the Meet of Champions was just one accomplishment Gess had to close out her season. Gess also won the 800-meter run at the NJSIAA Group II State Championships and was part of Haddonfield’s 4x800m relay team that won the event at the Group II State Championships and finished in the top-10 at the Meet of Champions. Next season, Gess will have a shot to do something only two other girls have ever done before: win the girls’ 1600-meter run at the spring Meet of Champions for the fourth time.